We are proud to announce our new partnership with world class cable manufacturer Swiss Cables from Entlebuch, Switzerland. We encourage you to take a moment and read over their innovative design philosophy, and core manufacturing principles. In a high resolution and time-correct audio system, the quality of cables will prove as important as the quality of the active chain components. Swiss cables products are the result of a complete blank sheet research approach, taking no pre-existent design paradigms for granted and leaving no stone un-turned to find better solutions and offer our clients with genuine sonic advancements and ownership value. That said, we strictly believe that all theory is void when not confirmed in practice - clearly audible. We are confident that a few minutes listening to the Swiss cables products will convince even the most discerned listeners that these cables establish a new performance benchmark, offering true reference sonics at unheard of favorable pricing. Copper based custom alloy, produced by advanced casting in protective gas environment, tempered to resonance-optimized hardness, conductor surface treated for optimal field propagation, signal flow and energy transfer. Custom field-balanced conductor geometry, yielding optimal field orientation and signal propagation while avoiding standing resonances found in conventional cable designs. As a consequence, the signal flows more freely with minimal energy transfer losses and bandwidth equalization effects. Advanced air-dielectric design, which eliminates MDI* and signal-reflection causing dielectrics and manufacturing methods, thereby avoiding the occurrence of multiple distortion sources and signal altering mechanical compression, damping and uncontrolled frequency curtailing effects found in conventional cables. *MDI, micro discharge interface distortion. the micro discharge interface distortion effects were discovered - already decades ago - by Dr. Pierre Johannet, a researcher at the french national electricity institute in the context of very comprehensive signal processing research. In summary, MDI results from very steep, high-amplitude ultrasonic spikes which occur during all electrical signal propagation. At frequencies relevant to audio, this discharge energy can take on sine wave character with significant impact on the audio signal, and can show up as measurable audible distortion by inter-modulation. swiss cables® in addition, MDI creates positive langevin ions (electrically charged particles in the room air), which, besides causing physical discomfort, have been found to obstruct natural sound field propagation in the listening room. Research into MDI has shown that the majority of modern dielectrics, including the much lauded teflon, plain or foamed, are associated with an increase in MDI. We have reviewed numerous cable termination technologies and countless connectors of different design and material composition to select those which provide the purest signal and overtone preservation, octave to octave energy equilibrium and energy transfer. Unsurprisingly, we found that simplistic formulas like "minimum metal“ don´t do the complex realities justice and can easily be annihilated by the choice of a single unfavorable manufacturing method or materials. 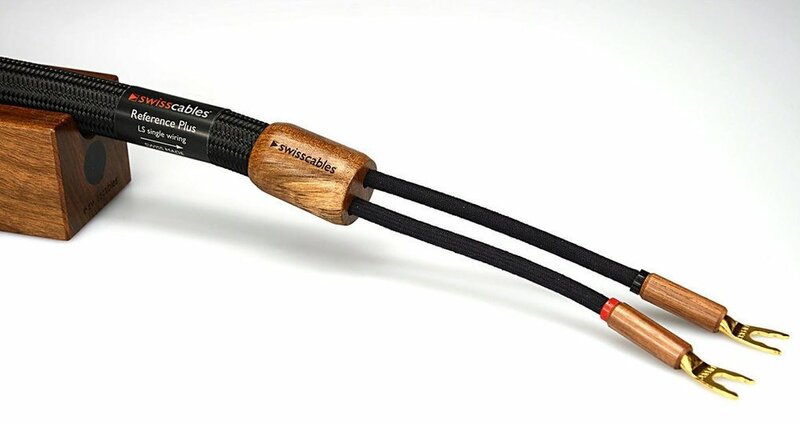 the new Swiss cables signal- and power-line cables are designed for listeners who value true fidelity performance and know it when they hear it. For those, a few minutes with these new generation products will be sufficient to recognize the groundbreaking performance and extreme value offered.